Echoes, too, of the fabulous Seeing Like A State by James Scott. Just found your blog its wonderful. I’m just just starting to learn about economics as a 55 year old retired businessman. Always had an interest buy the overarching big picture was fuzzy. I,am begining a OU degree in Economics/mathematical Sciences in October. Would you be so kind to recommend me 1 book to get a concise overview of the different schools of thought within Economics. I am interested to see where on this scale I currently sit with my life experiences that no doubt will colour my views. I want to be exposed to different ideas and enjoy pondering them without having an already chosen party line. So a big picture bool that will give me a framework to hang my evolving ideas on. Hello George! and thanks so much for your kind comment about the blog. If you specifically want ‘schools of thought’, Ha Joon Chang’s new book ‘Economics’ covers this. For a general overview of current thinking – mainstream but with different perspectives noted – Tim Harford’s two books, The Undercover Economist and the Undercover Economist Strikes Back are terrific general intros. 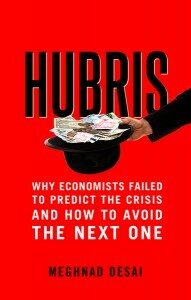 Meghnad Desai’s new book, Hubris, which I just reviewed here, is a bit more demanding than any of these (although still very clear) and also covers different approaches – it is mainly macroeconomics. You might also try some history of economic thought eg the books by Backhouse of Saandmo. But that’s enough – you probably have a long reading list for your course too!